Three senior leaders of India's ruling Bharatiya Janata Party (BJP), including Lal Krishna Advani, are charged with criminal conspiracy in connection with the demolition of a 16th century mosque 25 years ago. Three senior leaders of India's ruling Hindu nationalist Bharatiya Janata Party, including a cabinet minister, have been charged with criminal conspiracy in connection with the demolition of a 16th century mosque 25 years ago. Appearing in a special court Tuesday in Lucknow city, former deputy prime minister Lal Krishna Advani, cabinet minister Uma Bharti and Murli Manohar Joshi pleaded not guilty to charges of inciting a Hindu mob that tore down the mosque in December 1992. They were granted bail. The destruction of the mosque in the small, sleepy town of Ayodhya in northern India triggered some of the worst Hindu-Muslim violence witnessed in the country. About 2,000 people were killed. The three leaders say although they were present when the mosque was destroyed, they did not incite the mob that brought down the stone structure with pickaxes and crowbars. Hindus believe the mosque stood on the birthplace of one their most revered gods, Lord Rama and that Muslim invaders had built it after destroying a temple standing there. The BJP led a massive movement in 1992 demanding that Hindus be allowed to build a temple on the spot. Although a quarter century has passed, it continues to be one of India’s most contentious disputes between Hindu groups that want a temple built in Ayodhya and Muslim groups who insist the mosque must be rebuilt. FILE - Indian opposition leader and President of Bharatiya Janta Party (BJP) L.K. 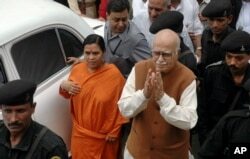 Advani, center right, and senior BJP leader Uma Bharti, center left, arrive at a court in Rae Bareilly, in the northern Indian state of Uttar Pradesh. The ruling BJP is throwing its weight behind the three stalwart leaders. Chief Minister Yogi Adityanath of Uttar Pradesh state, where the mosque was located, met the three outside the courtroom in a show of solidarity. Several senior party leaders appeared on television to maintain the three are innocent. Charges of criminal conspiracy against the three had been dropped by a lower court in 2001, but India's Supreme Court ordered a fresh trial last month. The trial is expected to conclude in two years and the three leaders have been told to appear personally in court. Political analysts say as the case is heard on a day-to day basis in the coming months, it will revive debate on what critics call the Hindu nationalist agenda of Prime Minister Narendra Modi’s government. They say the agenda includes issues such as erecting a grand temple on the disputed site and protecting cows, which Hindus consider holy. A BJP member of parliament, Sakshi Maharaj said Tuesday as he emerged from the courtroom that “no power on earth” could stop the construction of the temple.